t*rexes and tiaras: Vogue V8346. I mentioned a few weeks ago that I'd made a coat over the Xmas break. 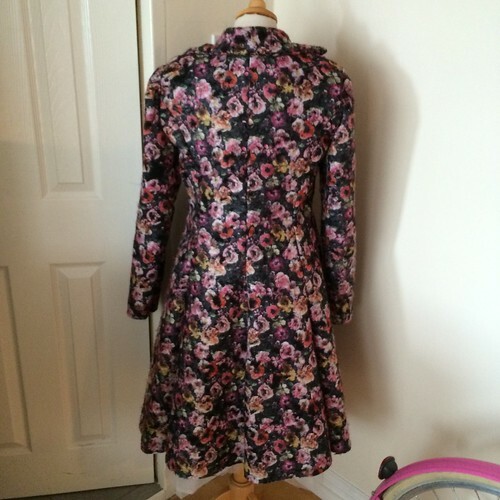 I'd not intended to make a coat, at all but having seen this fabric on clearance sale in my local haberdashery in November, I totally fell for it and bought three metres, in the hope that would be enough for an at-that-point-undiscovered-coat-pattern. I had parked the idea to one side whilst I got on with other projects, until I was in Solihull with Sarah just before Xmas. We had a look in the John Lewis haberdashery section and I bought Vogue V8346 on the recommendation of the lady who worked there. I'd been flicking through the catalogues knowing I wanted something about knee length with a full skirt and this fitted the bill rather perfectly. I couldn't wait to get started so as soon as New Year's Eve came around and I knew I had a day at home after a week or so of craziness, I set about cutting my pieces out. 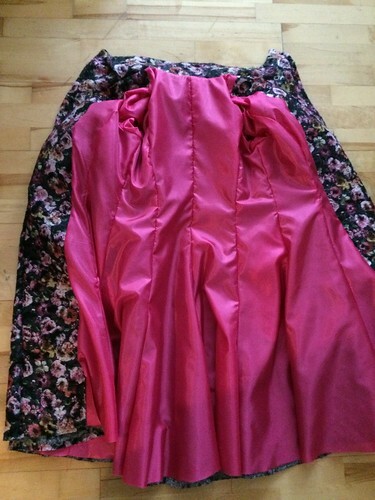 I'd picked this bright pink lining, which I liked and was rather cheap per metre. It's nice and shiny but wasn't too hard to work with. 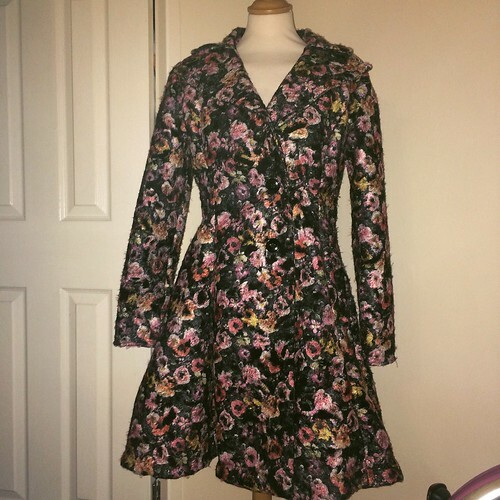 Now, I'd not made a proper coat before (let's forget the fact that one of the UFOs which haunts me is a jacket I began in my dressmaking lessons and never finished) and I am by no means an expert at dressmaking. I found that this pattern went together pretty easily and I couldn't fault the instructions. It went together rather like the cape I made. Obviously with sleeves. Plenty of panels were required to achieve the full skirt effect of the coat. 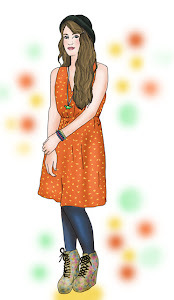 I'd chosen View <B> from the pattern, which gives five options with length and collar variations. 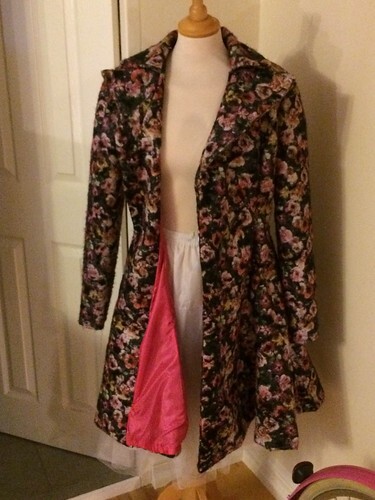 I kept checking how the skirt hung on my mannequin - I really liked seeing how the shape of the coat was coming together. 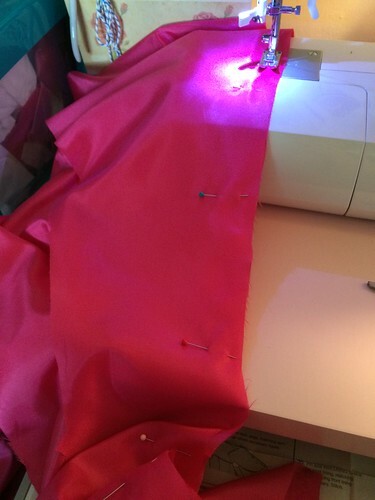 I didn't find it too difficult to stitch through the fabric and layers of lining, facing etc, which had been one of my main concerns, given that altering a coat is what led to the demise of my last sewing machine. I don't know whether that's because the Singer is stronger, or because my choice of fabric and lining wasn't as heavy-duty as some coats would be. All in all I think I spent about a day making this coat up. 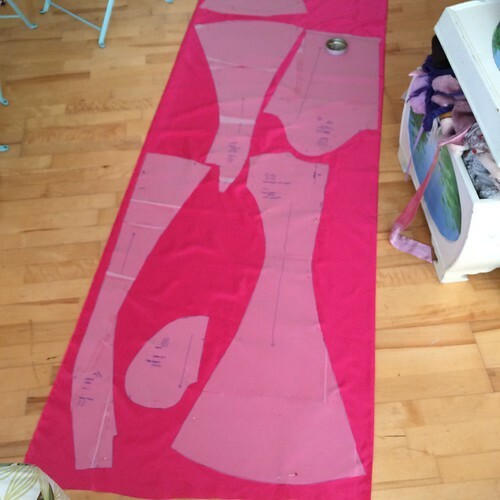 I decided to trace the pattern pieces before I started cutting them out, which is something I've only started doing recently. I sort of figured it makes more sense in case I want to make another length or style of the coat in the future. So that took a little more time than I'd usually expect. 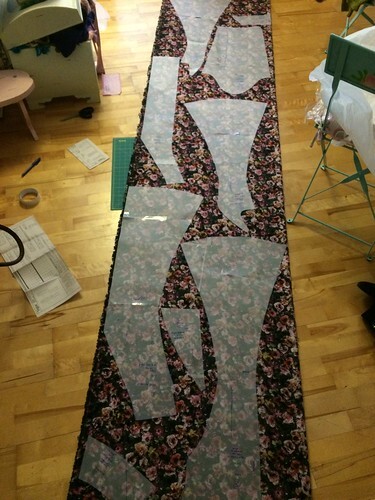 I then spent perhaps 6 hours once I had all the pieces cut out, sewing it together. Here's how it looked when it was finished. I do like the full skirt effect, which is the shape of coat I'd always prefer as it makes them easier to wear with fuller skirts and dresses. I followed the pattern almost exactly, until the very end instruction where I was to stitch buttonholes and add the buttons. I chose to use poppers instead and stitch a button on top of each of those. I also decided two would be sufficient, and placed them where I wanted based on the fit of the coat and how I wanted it to hang, rather than using the pattern instructions for guidance on where to place them. I'm not sure whether I'll make another coat - I'm sure if I find the perfect fabric I will. 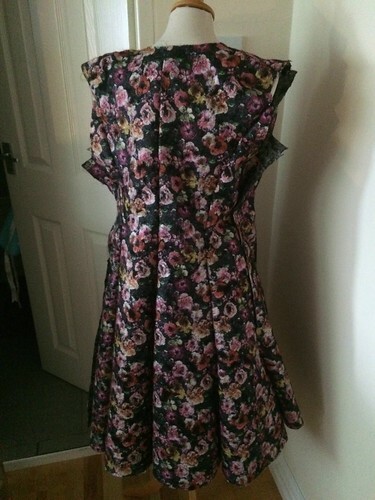 I'm quite impulsive like that with my dressmaking; I'll wait until I've found a fabric I like and decide what I want to turn it into, rather than having a pattern I want to make and searching for fabric to suit. I don't suppose I'll ever be one of those sensible stitchers who make a list or sketch a mood board of what their wardrobe is lacking and make the things from the list. That's just not for me. And how does it add up in terms of cost? Total cost: £64, which I don't think is bad for a winter coat when I consider ones I've bought in recent years from Louche, Tara Starlet, Warehouse, etc. Would you make a coat? This looks gorgeous, I love the pink lining! I haven't yet attempted anything coat-like on my sewing machine, but I picked up a cape pattern (fairly similar to yours I think, but not the same one) in a charity shop the other day (had no idea they had them, apparently they only get them in this one very occasionally), so I'm planning to attempt that towards the end of the summer I think - a long way off yet, but I want to get some more practice in on neatening up my projects and all that first. I like how you laid out the cost of this at the bottom too - great idea, I might be stealing it for my sewing posts! Also I didn't realise John Lewis had a haberdashery sections - we've only had one recently come to our area (it was the talk of the county I think!) but doesn't have that, boo. Thanks! I liked the bright contrast of the lining. It's something I'd been asked about recently (the cost of the garments I make) and not something I'd thought about too much before. I think on the whole making your own works out cheaper than buying, but then obviously that's going to be dependent on where you buy from. Looks great, gorgeous fabric. Geez patterns got expensive! Vogue used to be pricey and I suppose it's been at least 15 years since I bought a pattern. I was never fond of making coats at Uni, but did a few (obviously making my own pattern from scratch). I just don't like putting sleeves into things (because they aren't a symmetrical shape and look nothing like the armhole, you're about to fit them to) and the bit at the end-having to sew the hem/lining (without ending up with an inside out coat) always confused my brain, that bit! Well, if I'd have bought this pattern online and not from JL it would have been cheaper, I think. But I was impatient and wanted to get going with the project! 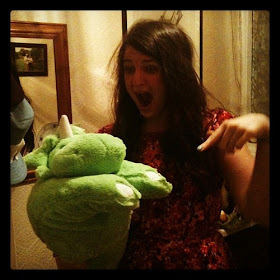 I'd love to see some of the things you made when you were at Uni - are there any photos? This is lovely Char, what sort of fabric is it? I've made the Deer and Doe Pavot before but it ended up being a bit big and I'm not sure it's worth trying to alter it and all the lining, I might just make a new one. I'd really like to make more of a winter coat and plan to do that sometime this year for next winter as I did't really have the time last year, which gives me plenty of time to research fabrics etc Did that lining fabric fray much? The tag in the store just said wool mix, so I'm not really sure what it is - I'm pretty hopeless at things like that. The lining was great to work with, not much fraying at all. I didn't make a toile so wasn't expectign it to fit perfectly, but it's not bad. A little big but I adjusted the placing of the poppers to try and counteract that. I did think that it worked out fairly reasonable.